We’d love your help. Let us know what’s wrong with this preview of The Year After You by Nina de Pass. Up in the Alps, Cara's old life feels a million miles away. Nobody at Hope Hall knows her past. With secrets to keep, can Cara allow herself this chance to live again? New Year's Eve, San Francisco. Nine months later, Cara's mother decides a Swiss boarding school will be the fresh start Cara needs. Up in the Alps, Cara's old life feels a million miles away. Nobody at Hope Hall knows her past – and she intends to keep it that way. Yet, as much as she keeps her distance, her new friends break down the walls she has so carefully built up – especially the offbeat, straight-talking Hector, who understands how she feels better than anyone. But the closer Cara grows to Hector, the more her old life slips away. Embracing life at Hope Hall means letting go of the past. With Georgina gone, how can Cara allow herself this second chance? To ask other readers questions about The Year After You, please sign up. Really good book! There was not all that much happening at the very start and I felt it was a bit slow to get into, but past the first bit I really enjoyed it! I don't know what it was about the story, but I just felt compelled to keep reading, even though plot-wise there was not that much happening a lot of the time. A lot of the points presented were really meaningful!! There were a couple that fell flat, but overall it was really nice. And the characters were super complex which was also refresh Really good book! There was not all that much happening at the very start and I felt it was a bit slow to get into, but past the first bit I really enjoyed it! And the characters were super complex which was also refreshing compared to a lot of YA books I've read lately. This was a really good contemporary, and I would definitely recommend! 5 Words: Friendship, grief, blame, second-chances, forgiveness. I think I'll start with the setting. I am a sucker for boarding school settings, the way that everything is so much more intense in close quarters, how relationships run at a different pace, the family-like quality of the people around you even (especi 5 Words: Friendship, grief, blame, second-chances, forgiveness. This was a cute debut. I had never read a young adult book set in the Swiss mountains before this one and I loved the atmosphere. The cover is particularly spectacular and sets the mood of the book perfectly. Still, this book wasn't really my thing. It read a lot like Anna and the French Kiss with the foreign boarding school setting, the group of friends, the love interest, the themes. I know that a lot of people will love The Year After You as much as they love Anna and the French Kiss. I was one of those people when I read Anna back in 2015, but my taste in books has changed drastically since then. The entire book read as a 2012 young adult book so that is probably why I didn't enjoy it that much. The beginning was a bit slow so it was hard for me to care for the characters right away, but 50/70 pages in I finally started to like Hector a lot. He was my absolute favorite character in the book: he's arrogant, smug and gets away with everything, but that's his charm. However, the more I went on reading, the less I cared about him. He changed more or less at the halfway point and started acting too immature for his age. For example, when he wanted to leave without notice or during the elevator scene with Cara. On the other hand, I had trouble connecting with Cara for the entirety of the book. I don't really know why, but she felt more distant than Hector even if she is actually the main character and the book is told from her perspective. Her backstory was really interesting and I liked the mental illness representation, but I didn't enjoy how the plot twist involved a particular thing that I can't mention because of spoilers. The other two characters, Ren and Fred, were alright. 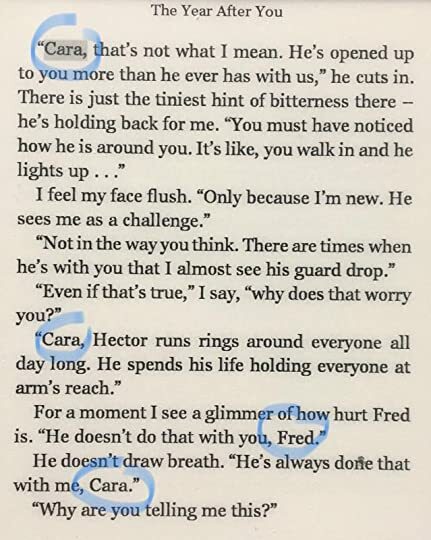 The book is more about Cara and Hector than about them, even if friendship is a big part of this book. The friendship was handled very well, but it was hard for me to get to know Ren and Fred. Fred was barely there and he was mean to Cara for no logical reason for the majority of the book. Ren was more part of the story but it still felt like I didn't get to read enough about her. Nina de Pass' writing style I really liked. It's simple and poetic. Nonetheless, there is still something that extremely bugged me because it was in every bit of dialogue. When talking, every character would always, always, always refer to the character they're talking to. "Cara, you need to calm down"
"It doesn't change anything, Ren"
"I can't do this, Ren"
"We all have baggage, Cara. I know that as well as anyone." "I can't be a friend to you, Cara. I tried. It's just too difficult." "You don't need to say it, Fred"
"Cara, he's the one who told you he wanted distance." It wasn't bad at the beginning of the book, but it gradually got worse and to the point where I couldn't overlook it anymore and it straight up annoyed me and distracted me from the story. Imagine reading a book with dialogues where everyone always begins or ends their sentences with the other person's name. So, I actually recommend this book if you liked Anna and the French Kiss. I just personally found it okay and a bit forgettable, but I'm sure a lot of people are going to love it. I loved this a lot. This book deals with topics like mental ilness and guilt (PTSS). The author did a great job of writing the characters, they are very believable. The setting is a boarding school so that's always interesting. I love how you kept learning more about the main character's problems and why she isn't perfect. But she too deserves forgiveness! So, great book for young adults or just adults. Possible trigger warnings: guilt, homophobia, suicide, mental ilness. Thank you to the publishe I loved this a lot. This book deals with topics like mental ilness and guilt (PTSS). The author did a great job of writing the characters, they are very believable. The setting is a boarding school so that's always interesting. I love how you kept learning more about the main character's problems and why she isn't perfect. But she too deserves forgiveness! I have always wondered about Swiss boarding schools and how they looked and felt like. I think it’s quite common when you live nearby and are used to seeing those secluded teenagers every time on the slopes. And this novel provided me so many answers. But it also provided an insightful and well-crafted tale about what happens when we refuse to acknowledge the things we cannot change. The heroine, Cara, after a tragic accident that triggered a deep depression, found herself at a Swiss boarding school. Her mother hoped to offer her a clean slate, but as Cara was well aware of, clean slates just. don’t. exist. You have to accept what’s happened before moving past that and heal yourself. Cara’s journey was punctuated by the presence of three three-dimensional characters: Ren, Hector and Fred. All of them determined to push Cara’s boundaries and help her throughout her recovery. Ren was an amazing side-character. She embodied all the qualities I treasure the most in a friend: loyalty, patience and infinite kindness. Hector was the hero, the guy with a permanent grin on his face and a terrible burden on his back. I didn’t guess his secret correctly and when it was finally revealed, I was left heartbroken. Moreover, the way his father treated him... it enraged me. Especially when he forced him to fly out of the country just to see his mother on his own. Fred, on the other hand, was the character I didn’t understand the most. The things he said to Cara after the first few weeks, held some unacknowledged truth, but he should have at least given her a chance before accusing her of being dishonest and shady. But he was 17, unexperienced and constantly on edge, and I remember quite vividly the way young people think and feel. This is why I couldn’t blame him for being that. Young and unfair. “With that one look I try to tell him a thousand things. That I can’t be his friend either. That friendship was maybe where it started but isn’t where it ended. That the ending part is almost more than I can bear, but I’ll do it. For him. Because there aren’t words for what he’s done for me. And if he was only meant to lift me to here, then that’s enough. After all he’s got me to the landing platform where I can lift myself –and for that I can excuse everything else. Will I read more works of this author in the future? Yes, of course. The only question is… How long will it take for her to publish another little gem? Greedy tendencies and all of that. Dit boek ligt in de lijn v KA Tucker haar laatste boek maar dit boek vond ik een pak beter. An exploration of grief and loss that breathes new life into the boarding school genre. This is a wonderful, soul-searching, but sad story of hope and grief and it is one of the best books that I have read in a while. It is set in Hope Hall, a Swiss boarding school located in the Alps. For me, one of the things that Nina de Pass did very cleverly was using the setting to maximum effect in THE YEAR AFTER YOU. Since my childhood, I have loved boarding school settings, as everything is so much more intense when in close proximity, such as romantic liaisons and relationships which tend This is a wonderful, soul-searching, but sad story of hope and grief and it is one of the best books that I have read in a while. It is set in Hope Hall, a Swiss boarding school located in the Alps. For me, one of the things that Nina de Pass did very cleverly was using the setting to maximum effect in THE YEAR AFTER YOU. Since my childhood, I have loved boarding school settings, as everything is so much more intense when in close proximity, such as romantic liaisons and relationships which tend to run at a different rate. The main protagonist in this novel is Cara, who I found to be exceptionally frustrating at times, though this did not spoil the story for me in any way. From an honesty point of view, she was pretty unreliable as a narrator, however, I had a great deal of empathy for her because of what happened to her best friend Georgina. I loved that Nina de Pass developed Cara’s character so well. I really liked all of the characters in THE YEAR AFTER YOU because they were so well formed as people with their own parts to play and were not just added after-thoughts to make the protagonist look better. For me, the story-telling also held some poignant messages about support mechanisms of friends and family and mental health issues. I think that THE YEAR AFTER YOU is a book that I will remember. I would certainly recommend reading it. The Year After You follows Cara who has been struggling with some things that she keeps hidden from potential new friends when she moves to a Swiss boarding school to help give her a fresh start. The mystery element and the boarding school setting are definitely what drew me in to it and whilst personal preference would have me wanting more mystery, this contemporary with a mystery element was done just right. Too often we get contemporary books that deal with tough topics (in this case, grief/s The Year After You follows Cara who has been struggling with some things that she keeps hidden from potential new friends when she moves to a Swiss boarding school to help give her a fresh start. The mystery element and the boarding school setting are definitely what drew me in to it and whilst personal preference would have me wanting more mystery, this contemporary with a mystery element was done just right. Too often we get contemporary books that deal with tough topics (in this case, grief/some mental health, and the book has links and info for helplines should anyone need it which is always a plus!) and they throw in a mystery which becomes insensitive to the topic and just... meh. This isn't one of those. The "mystery" element is somewhat vital to Cara's story and her character. It really helps drive home the plot and show us how this thing has affected her. Nina de Pass' writing was great and she was especially good at characterisation, particularly in the side characters. Honestly, I don't care much for Cara, but Ren and Hector were incredible and I wish we had seen more of Fred (at times it felt like he was just there for convenience, to add something so that something else could be discussed... wow spoiler avoiding doesn't make for coherent reviews, apologies!). I even enjoyed Hannah and Joy's characters, although at one point near the end it was like the author was trying too hard to give everyone some sort of backstory and understanding of why they are who they are and it just got a bit unnecessary, so for that I gave the book 4 stars. I will definitely be reading more from this author going forward. Cara has lived something traumatic and her mother decides to send her to a boarding school in Switzerland so that she can process and heal. But Cara has a lot of trouble connecting considering how guarded she is. And who could blame her? But Hector and Ren insert themselves into her life and Cara can't help but feel things and it's not without its challenges. I'm a sucker for boarding school stories and this was no exception. I loved the mountains setting and I could picture the snow and even feel the cold. The characters were all layered and all around interesting. I felt for Cara a lot and I really liked Ren and Hector. Cara's pain was very relatable and touching, it even moved me to tears. I really liked how everything was balanced and how the interactions between the characters were told, especially the flashbacks. I do love an unreliable narrator. The Year After You is a YA story about Cara, a teenager who is grieving and blaming herself for the death of her best friend in a tragic accident on NYE almost a year before the story takes place. Cara is then sent to Hope Hall, a boarding school in switzerland by her mother who thinks it would be good for Cara to have a fresh start. Cara is still grieving the loss of her best friend, while struggling with self blame, anxiety and depression. At Hope Hall she meets Ren, Fred and Hector. These thre The Year After You is a YA story about Cara, a teenager who is grieving and blaming herself for the death of her best friend in a tragic accident on NYE almost a year before the story takes place. Cara is then sent to Hope Hall, a boarding school in switzerland by her mother who thinks it would be good for Cara to have a fresh start. Cara is still grieving the loss of her best friend, while struggling with self blame, anxiety and depression. At Hope Hall she meets Ren, Fred and Hector. These three side characters also have their own struggles, however the friendship they build through out the story is a strong one. I really loved Cara's POV through out the story, and i loved that we didn't know everything about her in the beginning, and the longer the story went on, the more we found out. I also like the fact that Cara and Hectors relationship wasn't instant. And that while they were both closed off in the beginning, they learned to open up to each other and were able to build a relationship. The Year After You talks about real life issues, that a lot of people struggle with in silence. That was an emotional journey if I ever saw one. I definitely tend to stop myself from reading books like this, but when I actually finish reading them, it’s like I’ve been given this gigantic reward. My favourite books of all time have been things like ‘Neverland’ by Margot McGovern, ‘The Sister Pact’ by Stacie Ramey and ‘Love Letters to the Dead’ by Ava Dellaira, all of which follow in the same vein as this book. I think there’s something so beautiful and haunting about this book. The atmosphere That was an emotional journey if I ever saw one. I think there’s something so beautiful and haunting about this book. The atmosphere is so encompassing, like a shroud of energy - not the bad kind though - that leaves you in a trance-like state. I love, love, LOVE all of the main characters in this story. In fact I could go so far as to say I loved all of the characters because they were so developed as people and not just as props to make the protagonist look good. It had those important messages about friends, family, support systems and mental health. It was just a lot of really good things and it hit the right points for me over and over again. The moment I read the blurb for The Year After You by Nina de Pass I knew I had to read this book. So of course you can imagine my excitement when I was given and ARC of this book for free in exchange for an honest review! It's been a long time since a YA contemporary has hit me in the emotions quite as hard as The Year After You did, and I loved every second of it. Nine months ago, New Year's Eve, there's a Review copied over from my blog check it out for more reviews and other bookish content! Nine months ago, New Year's Eve, there's a car accident in San Francisco. Cara survives, her best friend Georgina doesn't. Consumed by grief, Cara cuts herself off from the world and is struggling to stay afloat, so her mother decides to send her off to "exile" in Switzerland. Hope Hall is supposed to be the fresh start Cara needs to put the accident and Georgina's death behind her; no one here knows her story and she'd very much like to keep it that way. Her new friends, however, have a different idea. As Cara gets ever-closer to the enigmatic Hector, the one person who might truly understand her grief, and her roommate Ren, things start to chance. But can Cara embrace life at Hope Hall when she doesn't believe she deserves a second chance? This is going to sound a bit silly because this is a book about grief, but I really wasn't expecting it to be as emotional as it was. Cara is very cut off from the world, she pushes anyone and everyone away, and yet she is a very engaging narrator. Even when she doesn't directly admit how she's feeling, it translates so well through her perception of the world and herself. You get a unique insight into Cara's thoughts and guilt that is very unique to Cara as a narrator. Much like Cara, the side-characters are well-rounded and engaging. Just like a lot of teens, they all have their own issues, especially Ren and Hector with their home-lives. You couldn't help but fall in love with them all as they tried to keep going despite the struggles they all had, and while trying to hold each other up. It's a book full of wonderful relationships between supportive teens that honestly really deserve a good hug. Despite the fact that The Year After You covers a lot of heavy topics and does focus on grief, it's still incredibly uplifting. There's a constant message that things do get better eventually, but not in a cheesy, sugar-coated way. As a reader, nothing is hidden from you; you see all of Cara's highs and lows. And yet it doesn't feel hopeless. You can see as Hope Hall slowly chips away at the negative thought spiral Cara is trapped in, and see how Cara pulls herself back out of the darkness. It's good to see a book that doesn't just show the happy ending after a tragedy, but the dark bits in the middle too. Almost a year after a car accident that derailed Cara’s life, her mother enrols her into Hope Hall, for her final year. Miles away from anyone who knows her, on a secluded boarding school in the Alps, Cara intends to keep her past a secret. But the one thing she didn’t account for were the students of Hope Hall. When I think random boarding school in the Alps, there’s a very stereotypical expectation I had constructed around this setting, but The Year After You utilises the setting very well which very much complimented the story. The way everything is trapped in this one mountain made the story more intense. Cara, our main lead, was brilliantly frustrating. I personally didn’t like her, but when we got to the end, I did feel for her. Her pain and confusion as she blames herself for the death of her friend, while trying to keep her new friends at an arm’s length, was honestly heart-breaking. I got this ARC from Netgally, which I am thankfull for. In this book we meet Cara a 17 year old girl who lost her best friend in an accident. She is sent to a boarding school called Hope in Switzerland by her mother to make a fresh start. At Hope Cara meets new people but because of her trauma she has trouble letting them into her life. This book deals with grief, guilt, friendship and family. I loved the way the friendships were build and how Cara developed herself after her trauma. The book wa I got this ARC from Netgally, which I am thankfull for. A poignant story of grief and guilt, hope and healing, set against the backdrop of a Swiss boarding school. Beautifully written and very touching. ‘the year after you’ hit so many nails on the head. The book was written beautifully and I was hooked by the first chapter and in love by the second. * trigger warning* mentions of suicide, mental health and anxiety. A whirlwind story of grief, honesty, friendship and acceptance. The book is narrated by Cara and we follow her on an emotional journey of self acceptance, new friendship and grief. Cara has been sent to a ‘the year after you’ hit so many nails on the head. The book was written beautifully and I was hooked by the first chapter and in love by the second. The book is narrated by Cara and we follow her on an emotional journey of self acceptance, new friendship and grief. Cara has been sent to a boarding school in Switzerland after a traumatic accident which left her guilt ridden and traumatised. During her stay she is befriended by Ren, Hector, and Fred; here she discovers, everyone has their secrets and their pasts which blur their future and burden their present. They discover the importance of forgiveness and acceptance. The guilt that Cara faces allows her to make a truly honest connection with Hector, sharing their horrible truths with each other and they both realise the importance of each other. The author allowed us to get a glimpse into the background of each main character and made you fall in love with each one a little more. They were relatable characters which faced a multitude of different issues between them which young adults and teenagers will be facing today. Thus making them more relatable and loveable. I loved the complexity of each character and how their issues were a key factor of the book, but their personalities and issues which arose never overshadowed the direct aspect of the plot. The storyline and characters were well balanced and made the book such an enjoyable and page turning read. I read it in one sitting and could not put it down! I don’t think there was one aspect of this book I didn’t like. Would recommend to anyone who loves books that contain a little mystery, genuine friendship and character development driven books. Review originally posted on The Bibliophile Chronicles. The Year After You follows a young girl named Cara who is sent to a boarding school in the remote Swiss Alps. On New Years Eve she survived a fatal accident, but her best friend Georgina did not. Consumed by grief, she wants nothing more than to complete the school year and move on, nothing is going to bring down the walls she has built around herself. But as she is drawn into life at Hope Hall, she begins to hope that maybe, things will get Review originally posted on The Bibliophile Chronicles. The Year After You follows a young girl named Cara who is sent to a boarding school in the remote Swiss Alps. On New Years Eve she survived a fatal accident, but her best friend Georgina did not. Consumed by grief, she wants nothing more than to complete the school year and move on, nothing is going to bring down the walls she has built around herself. But as she is drawn into life at Hope Hall, she begins to hope that maybe, things will get better. The Year After You is such a beautifully told story. It begins with a single tragic event that completely changes Cara’s life. The story focuses very heavily on grief and PTSD and it handled both of those issues extremely deftly. It really hones in on the idea of loss and how others around Cara – such as her mother – don’t want to believe that she’s suffering from a mental illness. The story is stunningly told with beautiful writing and I definitely felt myself becoming wrapped up in this well executed plot. The thing that really made the book for me is the characters. Cara is a real fleshed out character and she seems very realistic, but I also really liked Ren, Hector and Fred. They’re all loyal and fascinating characters and each one is dealing with their own secrets. I really liked seeing them develop as friends and grow as characters and that’s definitely one of the reasons I enjoyed this story so much. The Year After You also features a really stunning setting and the remote boarding school trope is one that I absolutely adore. The beautiful old building in the snowy Alps, the cable car journeys and the remoteness of the school really helped to bring this beautiful story to life. This YA novel takes place in a Swiss boarding school in the mountains of the Alps. The setting is wonderful and made me want to travel to a place like that immediately. 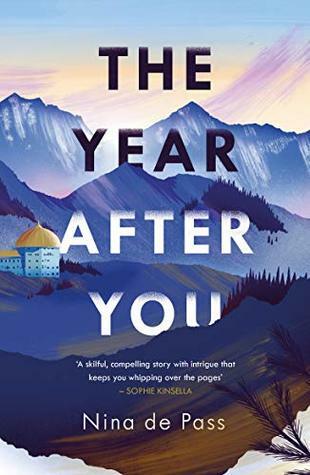 The Year After You is narrated by Cara, our main protagonist, and we follow her journey during the year after a terrible car accident in which her best friend died. Cara survives the accident but not without scars and finds herself struggling with depression. In hopes of helping her daughter find peace and offering her a clean s This YA novel takes place in a Swiss boarding school in the mountains of the Alps. The setting is wonderful and made me want to travel to a place like that immediately. The Year After You is narrated by Cara, our main protagonist, and we follow her journey during the year after a terrible car accident in which her best friend died. Cara survives the accident but not without scars and finds herself struggling with depression. In hopes of helping her daughter find peace and offering her a clean slate, Cara’s mom sends her to Hope Hall, a boarding school in Switzerland where Cara finds herself experiencing new emotions and her boundaries are pushed. Possible trigger warnings: guilt, homophobia, mental illness, suicide. The characters in this book have a very real feel to them, they make it easy to feel compassionate for them or to understand their struggles. Because Cara is so secretive, this book will definitely keep you guessing and even might confuse you since Cara isn’t the most reliable narrator. My only problem with this is that it quickly became very predictable. The story is quite slow paced and for me it started becoming too predictable for my liking, especially because there are a few parts in the book where nothing seems to happen at all. In the end, I think the author did an outstanding job in portraying these characters struggles and emotions in a beautiful and meaningful way. A very sweet story on how family and friends can be the very best support organism there is and play a vital part in our everyday life. Thank you Black and White Publishing for providing me a copy via NetGalley in exchange for an honest review. All thoughts and opinions are my own. This story is as refreshing and heartwarming as it is devastating. The storyline focuses on Cara, a teenager who has lived and lost her best friend within one night. We follow her journey from the beginning point of being enrolled to a Swiss boarding school, through all the hardships she faces from the previous year as well as the new ones she is met with. I cannot begin to express how much emotion this book brought out in me. The start was slow and didn’t quite grasp me, but the characters and setting were enough to make me read on, and I am so so glad I did. The plot, the characters, the shockers - all of the elements in this book knitted together to present itself as something beautiful. Hector charmed me to no end, his own life being an interesting tale to learn about, especially given the circumstances with Cara. Ren was a perfect friend with a struggle of her own, persevering with Cara to welcome her and ultimately befriend her. Fred was a necessary character and his personality made me very intrigued on multiple occasions, his kind nature making me smile. Cara, the focus. Through this story I didn’t realise how much I loved Cara. I didn’t realise how much her personality annoyed me as it did make me happy. Given her circumstances, her cold nature is understandable, and seeing her blossom through this story gave me a relief I never knew I could feel in a book. I’m proud of her and will continue to long for more, to want updates to how she is feeling. This is such a sweet book, I knew instantly that I was going to enjoy it. To begin with, how beautiful is that cover? If I saw this in a shop, I would not be able to resist picking it up. In the story, I was very intrigued about Cara's secrets, we knew certain details such as that her friend had died, that Cara had been injured yet survived but nothing much else. The intricacies of that fateful night are slowly revealed throughout the whole novel. The moment you think you understand what happened This is such a sweet book, I knew instantly that I was going to enjoy it. To begin with, how beautiful is that cover? If I saw this in a shop, I would not be able to resist picking it up. In the story, I was very intrigued about Cara's secrets, we knew certain details such as that her friend had died, that Cara had been injured yet survived but nothing much else. The intricacies of that fateful night are slowly revealed throughout the whole novel. The moment you think you understand what happened, another detail is added! The tale was brilliantly unravelled. The author has a wonderful way of writing charming characters, I adored Ren and Hector and even Fred, a slightly less involved character, they were funny, compassionate and relatable teenagers. I felt as though Nina's portrayal of these teens was so realistic, they were selfish and selfless, caring and sarcastic, perfectly imperfect characterisation. Every now and again I come across novels with flowing writing, sentences that run smoothly one after the other and that exactly the type of book this is. The only reason the book hasn't received a full five stars is because the trope of a 'damaged' girl and/or a troublesome boy is becoming a bit too repetitive for my liking. I wish there were more empowering stories that focused on the power of friendship or self help rather than damsel in distress type scenarios. If this book has taken your interest, I would definitely recommend it but be warned the novel does deal with grief and there are vivid scenes of the cause behind this grief. A compelling boarding school YA novel all about overcoming trauma and the saving grace of true friendship – a perfect book to snuggle up with on a snowy winter's night. Nina de Pass's debut YA novel is a fab read - I devoured it over a couple of days, racing to discover more about the secretive characters and their dark pasts, and to find out if, and how, they find redemption. Cara, the main character, is sent to boarding school in Switzerland as a last resort to overcome the trauma of a car ac A compelling boarding school YA novel all about overcoming trauma and the saving grace of true friendship – a perfect book to snuggle up with on a snowy winter's night. Cara, the main character, is sent to boarding school in Switzerland as a last resort to overcome the trauma of a car accident in which her best friend died. But there's more to the story than that, and if Cara is to start over, she must keep the truth from those who would befriend her. Yet at the same time, can she really forge new, lasting friendships if she doesn't come clean about her past? For anyone that has ever felt lonely and struggled to face their demons, Cara's story will feel familiar and cathartic. If the prose is sometimes a little heavy on the foreshadowing, it's hardly a deterrent to read the book as the characters are each unique and complex, and the strength of their relationships will draw you deeper into the story and its glittering, magical setting in the snowy Swiss Alps. Keep a tissue nearby - it's a sometimes emotional ride! The narrative is not very exciting at the beginning, but slowly the author brings in little adventures, quite a bit of romance and plenty of Cara’s thoughts. I really loved the boarding school itself, it sounded a little like Hogwarts, surrounded by mountains, and it feels like a happy place, where people actually want to return to. I really liked that the plot was set in different locations, it felt livelier and more indulging. I really enjoyed the writing style of this book, I can not understand how the author portrayed the grief, its effects through a confused teenager, so masterfully. The language used in this novel is easy to understand and it was a very enjoyable read. The chapters have a very decent length and it didn’t get boring, because every chapter brought in something new. I loved the ending of this book, it rounded up the story very nicely. I want to thank Netgalley for providing me with and arc of this book in exchange for an honest review. I cannot put into words how much I loved this book! When I started this book I didn’t expect to love it as much as I did but I couldn’t put it down until I finished it. This book took me on an emotional roller coaster and I spent a majority of the book with tears streaming down my face. Cara is such an amazing and complex character. I just wanted to hug her so badly. Her emotional journey was turbu I want to thank Netgalley for providing me with and arc of this book in exchange for an honest review. Cara is such an amazing and complex character. I just wanted to hug her so badly. Her emotional journey was turbulent and amazing. She was engaging and I felt every emotion she was feeling as if it was my own. I adored Ren and thought she was such an amazing friend to cara when she was at her lowest. Hector was probably my favourite character because I connected most with his story. I love how this wasn’t an insta love story but one that slowly grew into something amazing, genuine and beautiful. Overall I have to say this book is now one of my favourite books ever. I connected with it in a way I haven’t connected with a book in a long time. I felt everything while reading this book and it was defiantly worth the ride on the emotional rollercoaster! If this book is any indication Nina is going to be one of my all time favourite authors. 5 stars isn’t enough for how good this was. I requested this book from Net Galley to review, it was one of my very first advance reader copies, the cover art alone peaked my interest. Then I read the synopsis and thought it would be a interesting and easy read. Before I begin, I'd just like to say that this review contains thoughts and opinions that may spoil the plot. There are topics covered in this story that may be triggering to you such as: PTSD, grief, suicide and survivors guilt. As a preface to the main story, the main character Cara survives a horrific car accident on New Years Eve, but her best friend Georgina does not. The story begins nine months after the accident, Cara is struggling, she is consumed by guilt and grief. Her mum has sent her to a Swiss boarding school in the hopes that it will be a fresh start. This book ticked all of my boxes, easy to read, had me laughing, crying, internally screaming at, and empathising with the characters. It explored some difficult topics, and showcased beautifully how hard it is to be forced to endure the cruel things the world can dish out to you. I found the writing well developed, and it exceeded my expectations. I’m so happy to have discovered this author because she tells an amazing story amazingly well. I think the sense of claustrophobia was created really well, the intrigue and suspense of the mystery building up tension in the background, the weird innocence of new friendships, the mind games. It was a strange read, but a good one. The emotion ran through me whilst reading 'The year after you', following the ups and downs of Cara. I loved the fragility of Hector, Cara and Ren and their connections created at Hope. Nina de Pass started writing The Year After You, her first novel, while on a creative writing course at the Faber Academy. Nina has an MA in French and Spanish from the University of Edinburgh, and now lives and works in London.